From mid-summer to late fall hummingbirds and bees love trumpet vines! 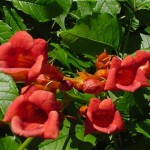 They produce abundant sprays of gorgeous trumpet-shaped, cantaloupe-orange to salmon-red flowers up to 3″ long on trellises, walls, arbors and fences all over northern New Mexico. 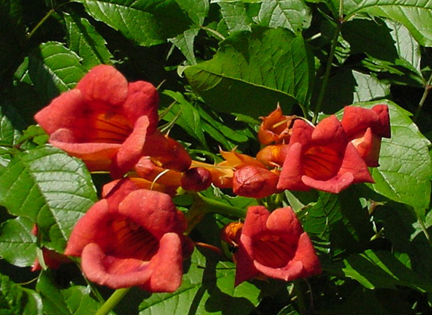 Shown above is Campsis radicans ‘Madam Galen’. This fast-growing vine needs full sun and it likes heat. Water regularly, especially during the first growing season. They need to establish a deep, extensive root system and be fed with a general purpose fertilizer. 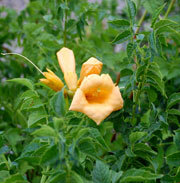 Trumpet vines adapt to almost any soil and grow vigorously. They can get top heavy, so make sure they have strong support. In warm weather the plant puts out huge number of tendrils that grab onto every available surface and eventually expand into heavy woody stems. Trumpet vines have been known to dismember the trellis or arbor they are growing on, so ruthless pruning is recommended. Prune when they are dormant in late winter or early spring to control size (note: because it blooms on new growth, early spring pruning will not affect the flowering).